The Second Hamas-Israel War of Nov. 10-21 inspired a mighty debate over rights and wrongs, with each side appealing to the large undecided bloc (19 percent of Americans according to CNN/ORC, 38 percent according to Rasmussen). Is Israel a criminal state that has no right to exist, much less to deploy force? Or is it a modern liberal democracy with the rule of law that justifiably protects innocent civilians? Morality drives this debate. To any sentient person, it is obvious that Israelis are 100-percent justified to protect themselves from wanton attacks. A cartoon from the Hizbullah War of 2006 symbolically showed a Palestinian terrorist shooting from behind a baby carriage at an Israeli soldier in front of a baby carriage. The clearest difference between the two sides. From Gaza: Ariel Sharon won reelection as prime minister in Jan. 2003 in part by mocking a rival who called for the unilateral withdrawal of all Israeli residents and soldiers from Gaza; then, inexplicably, in Nov. 2003 he adopted this same policy and put it into effect in Aug. 2005. I dubbed this at that time, "one of the worst errors ever made by a democracy." From the Philadelphi Corridor: Under U.S. pressure, especially from U.S. Secretary of State Condoleezza Rice, Sharon signed an agreement in Sep. 2005, called "Agreed Arrangements," that withdrew Israeli forces from the Philadelphi Corridor, a 14-km long and 100-meter wide area between Gaza and Egypt. The hapless "European Union Border Assistance Mission at the Rafah Crossing Point" (EUBAM Rafah) took their place. The Philadelphi Corridor as it existed until November 2005. Trouble was, the Egyptian authorities had promised in their 1979 peace treaty with Israel (III:2) to prevent "acts or threats of belligerency, hostility, or violence" but in fact permitted massive smuggling of armaments to Gaza via tunnels. 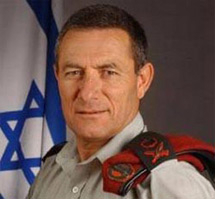 According to Doron Almog, a former head of Israel's Southern Command writing in early 2004, "smuggling has a strategic dimension" because it involves sufficient quantities of arms and materiel "to turn Gaza into launching pad for ever-deeper attacks against Israel proper." Almog considered these policies "a dangerous gamble" by the Mubarak regime and a "profound strategic danger" that could "endanger the Israeli-Egyptian peace accord and threaten the stability of the whole region." He attributed the lax Egyptian attitude to a mix of anti-Zionist views among officialdom and a readiness to vent the Egyptian public's anti-Zionist sentiments. Sharon arrogantly signed the "Agreed Arrangements," contrary to the strong opposition of Israel's security establishment. 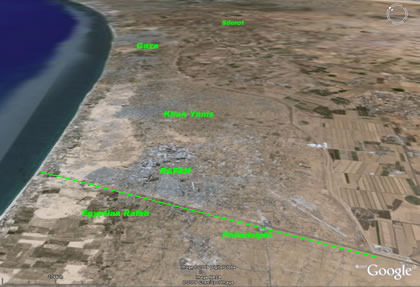 Of course, by removing this layer of Israeli protection, an "exponential increase" in the Gaza arsenal predictably followed, culminating in the Fajr-5 missiles that reached Tel Aviv this month. To permit Israeli soldiers effectively to prevent armaments from reaching Gaza, David Eshel of Defense Update argued in 2009 for the IDF taking back the Philadelphi Corridor and increasing its size to "a fully sterile security line of about 1,000 meters," even though this would mean having to relocate about 50,000 Gaza residents. Interestingly, the Palestinian Authority's Ahmed Qurei privately endorsed similar steps in 2008. Israel's Maj. Gen. (res) Doron Almog foresaw today's problems in early 2004. In contrast, Michael Herzog, formerly a high-ranking official in Israel's defense ministry, tells me it is too late for Israel to take back the Philadelphi Corridor; that international pressure on Egypt to stop the flow of arms to Gaza is the solution. Likewise, former ambassador Dore Gold backs joint U.S.-Israel "arrangements" to keep out new weaponry. I am skeptical about an effective American role, whether military or diplomatic; Israelis alone have the incentive to close down the arms transfers. Western governments should signal Hamas that they will encourage Jerusalem to respond to the next missile attack by retaking and enlarging the Philadelphi Corridor, thereby preventing further aggression, humanitarian tragedy, and political crises. Jan. 3, 2013 update: One of the curious side-stories of the November hostilities is how the Israeli government kept provisioning Gaza, and even the enemy militiamen, with sustenance during the fighting. As Dr. Guy Bechor of the Interdisciplinary Center in Herzliya noted: "We represent the first instance in history of one side feeding and financing its enemy, even during a time of war between the two." For details, see the Israel Defense Forces paper, Civilian Assistance during Operation Pillar of Defense, Summary Report, 14-21 November 2012, plus analyses by Sarah Honig, Ruthie Blum, Ryan Jones, and Tzvi Fleischer. Picture & caption from the IDF paper with specifics about provisioning Gaza. Jan. 21, 2013 update: For a follow-up blog on this article, looking at relations across the Sinai border, see "Morsi vs. Hamas, Hamas vs. Morsi." Related Topics: Arab-Israel conflict & diplomacy, Egypt, Palestinians | Daniel Pipes receive the latest by email: subscribe to the free mef mailing list This text may be reposted or forwarded so long as it is presented as an integral whole with complete and accurate information provided about its author, date, place of publication, and original URL.